Every year more than two million Americans fall and sustain serious injury, costing in excess of $3 billion. Hidden costs include pain, disability, lawsuits, deterioration in general well-being, and the impact upon other family members. Falls and the resulting injuries have become one of the elderly’s most serious health issues. As our senior population continues to grow, falls and their consequences will increase in the future. The accumulation of injuries and illnesses throughout our life changes or damages the central nervous system (CNS) and the body as a whole, and our bodies deteriorate through inactivity. Vision diminishes with advancing age, and this directly affects the sensory systems involved with movement. The sensory cells in the ear’s balance system change, gradually decrease and cannot be replaced. The activity of nerves that carry sensory information to the brain also diminishes with age, and complex brain interconnections lose connecting fibers and nerve cells. The ability of nerve endings to generate the chemicals responsible for the transmission of information also seems to be affected by aging. This process accelerates after the age of 50. Injuries to the knees, hips and back often do not completely heal, leaving some limitation of motion. Arthritis can cause permanent, crippling, irreversible effects. Osteoporosis leads to bone weakness and increases the probability of serious injury from a fall, or might cause a spontaneous fracture and lead to a fall. Muscle strength gradually decreases with age. Joint tendons and ligaments lose their flexibility and limit motion. Many diseases affect the CNS and sense organs. Hardening of the arteries (atherosclerosis) is probably the worst; it is accelerated by high blood pressure, smoking, and diabetes. Although it gradually increases during middle age, there is a point at which a slight additional decrease in blood flow causes serious vascular impairment such a stroke. Head injuries, sometimes caused by falls, can damage the sense organs in the inner ears or the brain itself. The worst disability occurs when both sense organs and CNS structures are damaged simultaneously. Physical activity is very important for recovery from injury to the sensory systems. The general debilitating effects of aging can negatively affect recovery if they result in a decreased level of activity. Central degenerative disorders, such as Alzheimer’s disease, can severely affect higher nervous system function. Disease of the eyes, such as glaucoma and cataracts, decrease visual sensory function and are a common problem in old age. The combined ravages of bone and joint injury, arthritis and inactivity can result in a body that cannot carry out motion commands initiated by the brain. As many of the problems responsible for falling develop during early and middle age, initial efforts to prevent injuries must be aimed at younger age groups. Many of the changes in muscle, bone and the central nervous system are not inevitable results of aging, but are brought on by inactive lifestyles and self-inflicted damage from smoking, poor diet, and lack of exercise. Although hardening of the arteries is occasionally hereditary, in most cases it can be reduced by diets low in cholesterol and saturated fatty acids, as well as regular physical exercise. This stimulates the muscles as well as the cardiovascular system and could greatly reduce this problem. If there is a family history of hardening of the arteries, medications to lower blood lipids and cholesterol are available. Early diagnosis and treatment of diabetes mellitus and hypertension can make a difference in the progression of atherosclerosis. Smoking cessation might also help reduce this disorder. Many of the medications used to treat hypertension, heart disease, allergy, insomnia, stomach acidity, and depression have side effects which influence brain function and can increase the likelihood of falling. In this time of specialization, it is possible for one patient to receive prescriptions from several physicians that might have additive side effects on brain and sensory function. Patients should keep a complete list of all their medications and dosages, and make this list available to each physician they consult. Coordination of all medications through a single primary care physician helps avoid adverse drug reactions. Many pharmacies use computer systems to warn the pharmacist about potential drug interactions. This requires that the patient purchase all medications from the same pharmacy or list all medications with each pharmacy. Unfortunately, some over-the-counter medications such as antihistamines, sleeping medications, analgesics, and cough suppressants can add to the side effects of prescription medications. Alcohol also affects movement and judgment and adversely interacts with many medications. Maintain balance and footing. If you sometimes feel dizzy, use a cane or walker to help you to keep your balance on uneven ground or slippery surfaces. Wear sturdy, low-heeled shoes with wide, nonskid soles. Exercise regularly. Regular exercise improves your strength, muscle tone and coordination. This can not only help prevent falls, it can reduce the severity of injury if you do fall. Walking is a good form of exercise. Don’t use difficult-to-reach shelves. Never stand on a chair. Use nonskid floor wax and wipe up spills immediately. Be sure stairways are well lighted and have sturdy hand rails. If you have a vision problem, apply brightly colored tape to the first and last steps. Put a light switch by the bedroom door and by your bed so you don’t have to walk across the room to turn on a light. Night lights in your bedrooms, halls, and bathrooms are a good idea. What about patients who have already fallen? Although rehabilitation is not perfect, much can be done. The first task is a thorough and complete evaluation of the patient’s sensory, CNS and muscle/joint function. A careful evaluation of the balance function should be performed. This includes a search for causes of dizziness, such as inner ear diseases that cause imbalance, an evaluation of the inner ear balance system which might be adversely affected by certain drugs (such as a class of antibiotics known as aminoglycocides), trauma, and the aging process. Tests of higher mental function are important since falling may be a sign of mental deterioration. 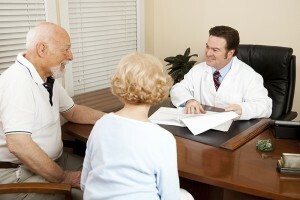 A careful review of all mediations (both prescription and over-the-counter) used by the patient is very important. If the patient needs medication for anxiety or depression, switching from a long-acting drug to one that is more quickly passed from the body seems to decrease the risk of falling. All correctable problems should be treated. Visual correction with proper eyeglasses, improvement of hearing by hearing aids, adjustment or elimination of medication, and correction of high blood pressure or any other disease which could impair balance must be accomplished. Rehabilitation includes increasing the range of motion as well as physical strength. A very important part of rehabilitation is helping patients overcome their fear of falling and thus avoid further injury. Walkers and canes can aid stability, and adaptations in the home are important. Simple changes such as installing hand holds in bathrooms or along walls could decrease the likelihood of falling and increase patient confidence. Removing the patient from a familiar environment, or drastically changing it, often hampers recovery. As soon as possible, rehabilitation should be moved to an outpatient setting with participation of family members and home support groups. Rapid return to physical activity and social interaction with family and community can often stop the vicious spiral into inactivity, exclusiveness and progressive deterioration.